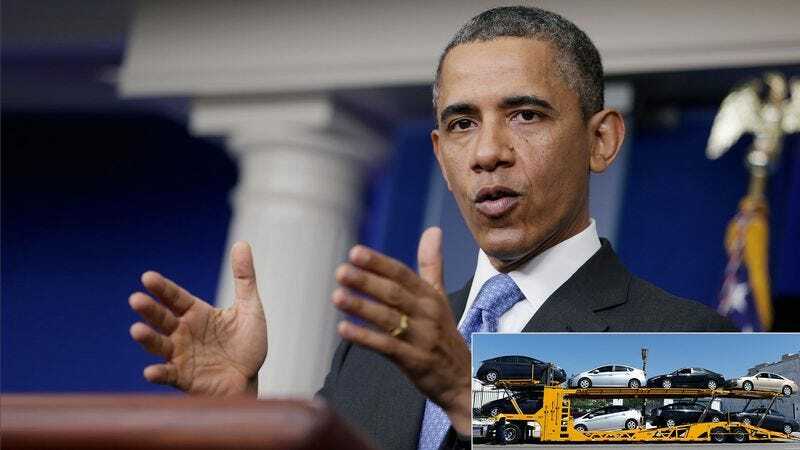 WASHINGTON—Speaking at a nationally televised press conference from the White House this morning, President Obama explained to the nation how they load all those cars onto the trailer of one of those big transport trucks. Noting that you can usually fit “eight or nine” cars on the backs of one of those big trucks, Obama went on to explain that the process of getting the cars off of the big truck is largely the same process as getting them onto the big truck, only in reverse. The president then confirmed that drivers can usually load an entire truck full of cars in about an hour, although with cars of different sizes the loading process can take considerably longer. After asking if there were any more questions, President Obama then concluded his remarks by saying “Thank you” and walking off stage.